We’ve been growing Spider Plants (Chlorophytum comosum) for umpteen years, so long that we won’t give them a second look when we visit garden centers – or so we thought. 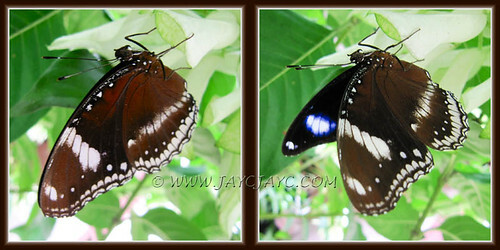 Recently though, we were spellbound by their presence at a nearby garden center that we dropped by early last month. 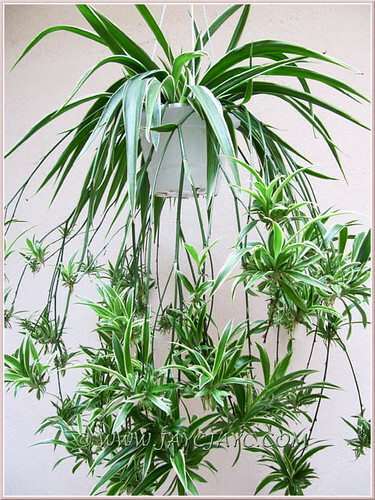 With outstretched limbs and crying to be adopted were three hanging pots of Chlorophytum comosum ‘Variegatum’, the most fabulous and healthiest Spider Plants that we’ve ever seen. So fertile and showing off countless baby spiders on a great number of branched stolons that gracefully arched and swayed like can-can skirts in the gentle breeze. Really had us fascinated and we stood gawked at them, transfixed by their beauty. 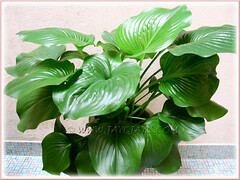 We also brought home a pot of dwarf-sized Anthurium with pink flowers that cost us RM10/= and a pot of Syngonium podophyllum with small variegated leaves for RM13/=. These unexpected garden purchases really made our day! 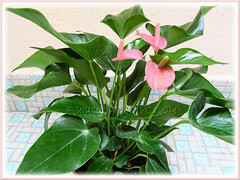 Anthurium andraeanum (Flamingo Flower/Lily, Tail Flower), a dwarf variety with small pink flowers and glossy dark green leaves. Syngonium podophyllum: cultivar is ‘Pixie’. 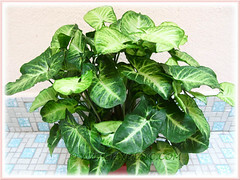 It has variegated leaves in various hues of green with creamy white veins. 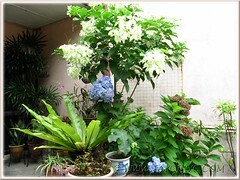 It sure was a surprise to see our repotted plant which had been cropped early this year reblooming again. This variety with pink and white variegation, that is blotched randomly on its bracts is our favourite Bougainvillea species amongst those that we grow. Its stunning bi-coloured bracts certainly do catch our attention, lends interest to our tropical garden and enliven the landscape whenever it blooms. We’re hoping to propagate one more plant from stem cutting. Quite a frequent visitor as attracted by the colourful flowering plants at our frontyard. This time it hung for dear life on the colourful white bracts of Mussaenda philippica ‘Aurorae’ after leading me on a merry-go-round. Thank God, it finally decided to be good and posed well during the photo session. How wonderful.. I was able to get several shots! Just love these flying beauties that visit us. We’re most pleased with the luxuriant growth of this fabulous foliage plant that also surprising flowered for us during the Easter Season. It was almost sent to the gallows when its foliage was badly diseased with leaf rust. A hard prune not only spurred its blossoming but rejuvenated its growth to be the star at our courtyard for the month of September. Again, we tried propagating the only one remaining seedpod that stood the test of time. Yay, it seems to be successful as seen in the photo-montage below! Our patience certainly paid off and we’re richer by another addition. How wonderful! 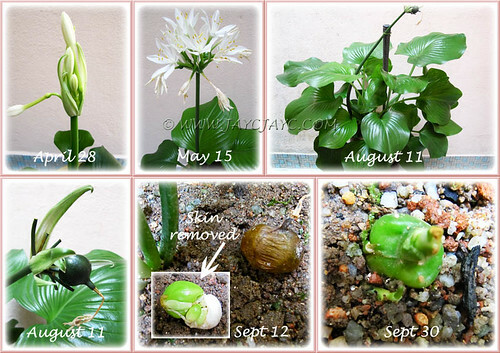 Here’s our previous experiment on propagation of Cardwell Lily by seeds, if you’re interested. Update: Nov 4 2011 – An image here to show that a leaf sprouted in early October. Commonly known as Tabasco Pepper or Chilli Padi in Malay, this variety of Capsicum at our backyard, though tiny (about 3 cm long), is super hot and fiery. 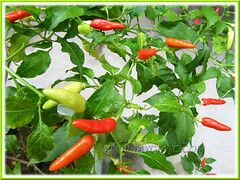 For almost half a year, it has been constantly supplying us with a good many chilli pods for our daily consumption and sufficient to share with friends as well. It can be taken chartreuse or red. We just need to harvest 4-6 of this fiery little devils each day, which is more than enough to satisfy our palate. That’s as much chilli heat as we can take per day, because eating one too many would send us scurrying for the chocolate bar to counteract the pungent flavour! Even taken without the seeds, it is hot, hot, and really hot! Yay! I’ve finally managed to get a few zoom-in shots of a magpie bird, after numerous unsuccessful attempts over many years. Though not that sharp, I am pleased to have been able to snap it, nonetheless. This smaller species of the black-billed magpies are such frequent visitors to our backyard, either scavenging for kitchen scrap strewn on the ground and drain or singing their hearts out on rooftops and telecommunication cables! Their loud, sharp and melodious whistling, usually done in a duet manner, is truly splendid and such a pleasure to listen! I certainly do look forward to hearing their singing each day. 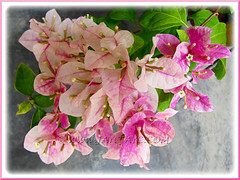 Oh I normally don’t like spider plants but that one does look lovely, and I have never seen a bouganvilla that colour. Looks as though you were successful propagating the Cardwell Lilly, congratulations. Thanks for visit and kind comments, Gillian! Gee… just had a peep at the tiny bulb and observed that a leaf had sprouted. Yay! !